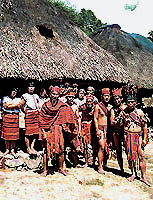 THE LIFESTYLE, RITUALS, AND TRADITIONS OF THE FILIPINO HILL TRIBES, FROM THE CORDILLERA MOUNTAIN HIGHLANDS, ARE FEATURED IN THIS HISTORICAL SHOW. 110 OF THE WORKS, INCLUDED IN THIS REMARKABLE EXHIBITION, HAVE BEEN SELECTED FROM THE ARCHIVES OF MAJOR INSTITUTIONS: THE SMITHSONIAN, THE HEARST MUSEUM OF ANTHROPOLOGY, UCLA'S FOWLER MUSEUM, CHICAGO'S FIELD MUSEUM, THE AMERICAN MUSEUM OF NATURAL HISTORY, THE BROOKLYN MUSEUM, THE METROPOLITAN MUSEUM OF ART, THE NATURAL HISTORY MUSEUM OF LOS ANGELES COUNTY, AND THE PEABODY MUSEUM OF ARCHAEOLOGY AND ETHNOLOGY AT HARVARD UNIVERSITY. THIRTY ONE ORIGINAL PHOTOGRAPHS, FROM THE 40'S BY EDUARDO MASFERRE; THE SUBJECT OF A TOURING SHOW SPONSORED BY THE SMITHSONIAN, ARE ALSO INCLUDED. THE DOCUMENTATION IN "THE LAST FILIPINO HEAD HUNTERS" EXHIBIT COMBINES THREE PHOTOGRAPHIC SURVEYS, WHICH SPAN MORE THAN A CENTURY, DEPICTING THE HABITATS, FAMILIES, BODY ADORNMENT, AND ORIENTATION OF THREE MAJOR NORTHERN FILIPINO GROUPS: THE BONTOC, IFUGAO, AND KALINGA TRIBES. THE PERSONAL EXPERIENCE OF TEN INDIVIDUAL TRIBAL MEMBERS IS INCLUDING: A SHAMAN, WIFE, FATHER, CHILD, HUNTER, WARRIOR, AND CHIEF. THE IMPACT OF THIS SENSATIONAL PRESENTATION IS STAGGERING. THIS IS THE MOST COMPLETE AND DEFINITIVE PRESENTATION EVER ASSEMBLED ADDRESSING THESE SOON TO BE EXTINCT TRIBES. HISTORY IS CREATED AND CAPTURED FOR SUCCESSIVE GENERATIONS TO APPRECIATE, IN THIS CONCISE, WELL THOUGHT OUT MOSAIC OF VANISHING TRIBAL LIFESTYLE. THIS IS ONE OF OUR BEST SHOWS! DISPLAY DIMENSIONS: 8" X 10" - 16" X 20"
VIDEO TAPE: "ONE DAY IN A HEAD HUNTERS' LIFE"